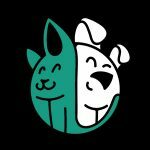 Not only will grooming your dog on a regular basis help your pooch look their best, but it is also an important activity for the good of their health. If you let their fur grow out too long and shaggy, this is not hygienic and can end up being home to bacteria and parasites. While some people take their dog to the professionals to be groomed, you also have the option of doing the job yourself. And if you are going to do this, you need the best dog grooming clippers. Whether you have bought this type of product before or this is your first time, you will want to choose some clippers which are suitable to your needs and do the job effectively. To give you a better idea of what is available, here are our top 10 choices. Designed to cut through even the thickest of dog hair, this high-power set of clippers are self-sharpening and snag-free. As well as the clippers, you also get a range of accessories including blade guard, cleaning brush, and mirror. Four guide combs are also included to make it easier to get your dog’s coat to the length that you want. And it is also ergonomically designed for your easy usage, meaning that you can comfortably complete the task of grooming your dog until they look their very best! A highly-rated dog grooming kit, a range of accessories are included such as clippers, scissors and combs. The clippers are low-vibration and quiet as a whisper, so they are less likely to startle your dog when you use them. As well as being ergonomically designed, they also feature a rechargeable battery and are ready whenever you need them. As for the blades, they are adjustable to offer a precision cut which is not going to pull at your dog’s hair uncomfortably. And for added peace of mind, lifetime replacement is guaranteed. After they have been fully charged, these cordless dog grooming clippers will last for seven hours, so you don’t have to worry about them running out of juice in the middle of a grooming session! The power is high enough to ensure that hair won’t get clogged up in them. The 33 sharp teeth make short work of the coats of even the hairiest dogs. As for the noise factor, the clippers come with a silencer built in which is designed to reduce friction between the blades and also lowers the noise. This stylish set of dog hair clippers is thin and lightweight, and also comes in a range of different colors. They are designed for all types of coat and different dog breeds. As for the blades, they are detachable, as well as being easy to change and clean. Using a two-speed rotary motor, it offers a high level of performance. The cord is designed for easy manoeuvrability, while the housing is shatter-proof, so you don’t have to worry about dropping the clippers. Choose between two speeds depending on how much power you need to cut through the coat of your furry friend. These pet clippers have been designed to offer a high level of strokes per minute, as well as a wide blade sweep which facilitates fast clipping. Blade changes are quick and easy whenever you desire. As well as the #10 CryogenX blade, you also get blade oil, clipper grease, cleaning brush, and replacement carbon brushes. 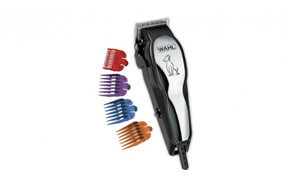 If you have a medium-sized dog, these Wahl dog clippers are ideal for keeping their coats in check. The speed of the clippers reaches up to 7,200 strokes per minute, but you would not expect that it was so powerful from the low level of sound produced. Seven different attachments are included so you can trim your dog’s fur to the length you want. Made in the USA by a company which has been operating for a century, the kit also includes a host of other useful items to facilitate grooming your dog. 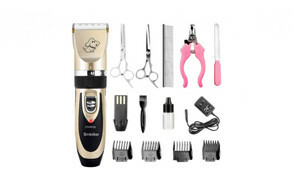 This set of rechargeable dog hair trimmers also includes a Li-On battery, so you don’t have to worry about it dying when you have only done half the grooming job! The blade is both strong and sharp enough for long-term usage. To ensure that your pet feels relaxed while grooming is taking place, vibrations are low, and the design is ultra-quiet. However, you should be wary that if your dog has longer hair, you may need to use scissors on them first to ensure the clippers work effectively. A highly-popular US brand of dog clippers, these are designed for trimming medium-length coats. As well as being easy-to-use, this is also a quiet brand of clipper which is less likely to disturb and startle your dog. Tough and durable, these clippers have a two-hour runtime, which gives you ample opportunity to do all the grooming you need. There are several color guide combs included, so you can choose what length of coat that you would like to give your dog. Trim your dog’s coat smoothly and efficiently with this set of professional dog clippers which feature a titanium acute-angle blade. Several limiting combs are also included to provide varying hair lengths, and you can safely trim your dog’s coat even if you a first-time dog groomer. Using a precision motor, vibrations are low, and the working noise is lower than 60 DB, so it is not likely to scare your pet. It is also cordless, so you can easily use it freely. If your dog has a particularly heavy coat, this powerful clipper operates at a high enough speed to make grooming them straightforward. Its smart design eliminates the need for fans and vents which can end up getting clogged up with hair. You can fit it with a wide range of detachable blades, and the noise of the clippers is unlikely to bother your pet. And the locking switch ensures that the device does not shut off halfway through using it. Now that we have talked about some of the top products currently available, it is time to think more about the individual features which make great dog grooming clippers. The main distinction between dog clippers is that they are either corded or battery-operated. Of course, both varieties have pros and cons, which we will discuss in a little more detail later in the blog post to help you make your mind up. Scroll further down the page if you would like to find out now. Obviously, this only applies if you are using battery-operated clippers, but the length of the charge and running time may both have an impact on your decision. While some need to be charged for hours, others will run after just a few minutes. As for the running time, this is also worth checking as shaggy-haired dogs can take a long time to properly trim and you don’t want to risk the clippers dying midway through grooming! While some clippers are only suitable for short or medium-haired dogs, others promise to work on even the hairiest of pooches. And while some are best for simple trimming and touching up your dog’s coat, others can be used on the whole thing. So, before purchase, you should consider what type of dog you own and what their individual grooming needs are. Check the product description for the number of strokes per minute. The higher the figure, the quicker the blades of the clippers move across each other. The problem with some dog clippers is that they are simply too loud and can end up startling your pooch. If you are concerned about this being a problem, you should select a set which doesn’t give out too much noise. Thankfully, many of the products which we have selected above fit within this category. There may even be a figure in decibels which tells you exactly how loud they are. If you have a particularly nervous or anxious dog, it is especially important that you choose clippers which are not going to frighten them. Quite a few of the products above are grooming sets which also include other items as well. For example, there may be some color coded guide combs which can be used to cut your dog’s coat to different lengths. Other potential inclusions are scissors, combs, and clipper oil. While these accessories may not be the main reason why you buy the product, they could convince you to choose one set over another. However, you should always bear in mind that the clippers are the main item that you are buying, and the others are just optional extras. Since you are the one using the dog clippers, it makes sense that they are comfortable and easy to operate. So, look at whether the clippers are thin and lightweight or thick and durable. Which would be easier for you to use? Of course, the corded or cordless factor is also likely to play a role in your decision-making. The cordless models are generally easier to wield, but they may not be suitable for dogs with particularly long and shaggy coats. And you should also check on whether they feature an ergonomic handle which is easy to hold. If you don’t have a great deal of experience in grooming your dog, it is especially important that the clippers are safe and easy to operate. Guide combs are always a useful safety feature as they act as a barrier between your dog’s skin and the blades. You also don’t want to risk snagging or catching your dog’s fur. So, you should also check the material used in the blade, the quantity, and their angle. You could also look at the clippers that run at variable speeds. This way, it is much easier to clip the sensitive areas of your dog’s coat such as around their eyes and ears. The final points to consider are the customizable features of the grooming clippers. For example, if you can change the blades, this means that it is easier to cut your dog’s coat to a variety of lengths, and you can also switch them if they become old and dulled. Another major customizable feature if you can switch the running speed based on the length of your dog’s coat and whether you are cutting it entirely or simply giving them a touch-up. While clipping your dog’s coat may seem like a slightly intimidating activity at first, it is one which has a host of benefits if you do it yourself. Still not convinced? Here are just a few of the major advantages. The first and most obvious reason why you would want to invest in dog clippers is that they are economical. Essentially, you can treat them as an investment. If you have ever taken your dog to a professional groomer before, you will already be aware that this can be a costly session. Of course, it may take a big of practice before you can do the job well, but this still may be a skill which is worth learning for yourself. Even if you do decide that you want to keep taking your dog to the professionals, owning a set of clippers allows you to give them a quick trim as and when you like, which cuts down on the number of grooming sessions you need to book. You may never have thought of dog grooming as a bonding experience, but, in actuality, it provides a great occasion for you to build up your furry friend’s trust. It may take a while before they are fully comfortable with the experience, but over time, it can end up contributing toward an enhanced owner-pet relationship. And what dog owner wouldn’t want a closer bond with their furry friend? Some dogs suffer from anxiety and don’t like being handled by a strange person in an unfamiliar place. This is likely to make going to a professional dog groomer a distressful experience, but if you cut your dog’s coat yourself, this will help to stop them from feeling so nervous. After all, you have taken a long time to build up a sense of trust with your four-legged friend. However, it still may take some time before they are entirely comfortable with the experience of having their coat clipped. So, you should have plenty of treats to offer them, and you should also be ready to give them a lot of love and praise. You need to have the patience to get them used to proper grooming, but it is a worthwhile task in the long-run. Many health issues are directly related to your dog’s skin and coat, so if you groom them yourself, this provides the ideal opportunity to check up on things. You should check for any fleas or other parasites which are trying to make their home on your dog, and you can also inspect for any strange of unfamiliar skin abnormalities which need to be reported to your vet. Regular trimming also helps to remove any dirt or waste which has got matted up in your dog’s fur. Sometimes, you only need to get rid of a couple of mats from your dog’s coat, and you don’t want to have to take them into the vet every single time this issue arises. At the same time, trimming your dog’s fur on a regular basis also reduces the chance that humans who come into contact with them are going to suffer from an allergic reaction – a relief for allergy sufferers who come to visit your home! A properly groomed dog looks so much better and healthier than one who is matted and shaggy. Even if you only use the clippers from time to time, this allows you to do the basic tidying up of your dog’s coat which leaves it looking at its best. And if your dog is improperly groomed, this can also lead to bad smells. Owning a good-looking dog is not only in your own interests; it will also help them to feel at their best and most confident. When you buy a product like dog clippers, you want to make sure that they stand the test of time and work effectively for as long as possible. While choosing a high-quality set is one way of ensuring this, you should also make sure that you carry out regular maintenance. So, here are a few pieces of advice to help you out with this latter point. Push the blade latch release and remove the blade. You can then examine it for obvious signs of wear, as well as checking the cutter and comb are correctly aligned. You should also check the lever/blade drive. When it looks like it is worn, it is time to replace it. If you have noticed that your clippers are running slower than normal, you should look closer at the brushes. When they have worn down to half their original length, you should then replace them. And if the clipper blades appear loose or release halfway through cutting, you may need to replace the latch. If you want to look into sharpening the blades instead, you could check the manufacturer for more information and/or take them into a professional service center. Before you undertake any maintenance work on your clippers, your first course of action should be to unplug them. Once you have done this, you should then start with the simple task of taking out all the hair from vents and other places where it has become trapped. If you have a bristle brush, this makes the task just a little bit more straightforward. Do this after every time you use them, and this will keep them neat and tidy. When you want to give the clippers are deep clean, you can wash the clipper blade in a blade wash solution, running it for a few seconds. Next, take the blade off the clippers and put it on a towel to dry. Once the clippers are dry, you can then hold the clippers blade side down and spray them with a disinfecting spray. A few drops of between the lower and upper blades while the motor is running will keep them operating smoothly. The excess oil and hair should drop off as it is running. Finish by turning off the clipper and gently drying it with a cloth or paper towel. As we mentioned earlier, the decision about whether you would like to use corded or cordless clippers is an important one. Professionals often use both. So, let’s look in more detail at both possible options to help you make your mind up. Ultimately, it all comes down to your personal preferences. Obviously, the major plus point is that you don’t have to find a power point to use them! Also, they are lightweight and easy to manoeuvre, so you can easily get into those more challenging areas. On the downside, you have a limited amount of battery life. When you are running them through thick hair, this can consume a lot of power. So, always check the twin factors of the charge and running times to ensure that you get a brand which you are satisfied with. Your other main option is to buy corded dog clippers. Generally, you have more freedom to switch the blades for different coat lengths and cuts. Obviously, once you have plugged them in, there is no problem with battery life and no worries about running out of power halfway through a grooming session. You have the obvious downside of needing to plug them in, and the cord can also make them trickier to manoeuvre around. If you do choose a corded model, check the length as those with a longer cord tend to be easier to use. Q: Is there a difference between dog clippers and human clippers? A: At a glance, it seems like dog and human clippers are the same, but their specific features make them different. The main reason why it is better not to use human clippers on canines is that the blade teeth tend to be arranged closer, which can lead to jamming and discomfort. This is especially true if you have a thickly coated dog breed, whereas human clippers are generally designed for lighter hair. Specially designed dog clippers are usually made from heavier metal and tend to be sharper than human clippers. Generally, human clippers are cheaper than dog clippers as they not as sharp and not as powerful. Q: Can I shave a matted dog or a wet dog? A: Matted fur quickly becomes heavy and uncomfortable, so it is better to prevent these in the first place with frequent brushing. But if your dog has become severely matted, your only option may be to shave him with a very short clipper blade. You can wash your dog before clipping and give them a wet shave. In fact, this is a good way of protecting your clipper blades, as well as being easier on your dog’s skin since the clippers should move through the coat more easily. Q: How often should I groom my dog? A: The frequency of dog grooming depends on several key factors including the breed, hair length, and type of coat. As a rule of thumb, you should groom them at least once per month. It may take time to get puppies and younger dogs used to this process, but it avoids grooming issues which stay with them into adulthood. Clippers, brushes, and combs allow you to do some tidying up work before big grooming sessions. Q: How can I make my dog more comfortable with grooming? A: Some dogs don’t enjoy being clipped, and it is especially important that you ease their anxiety as best you can. You can start to reduce this problem by starting the grooming process when they are a puppy. Make sure that you take special care of their sensitive areas including the groin, muzzle, tail, eyes, and ears. If you train them to recognise a word like ‘ear’ before you touch them there, this will give them a warning. Have plenty of treats ready to offer them to make the whole process more enjoyable, and make sure that you praise them all the way through. Another way that you can keep them calm is by using quieter dog clippers which don’t startle them. A pair of pet earmuffs may even help with the job! Q: Is it safe to groom my dog’s ears, paws, etc.? A: We have just mentioned how these are particularly sensitive areas of your dog, but they often need grooming too. If the fur gets too long, it is prone to becoming congested and infected. You can trim these areas yourself, but you need to make sure that your dog is feeling calm and you take special care. Small-headed dog clippers on a reduced speed setting are best. Keep checking the clippers regularly to ensure that they aren’t overheating. Suitable for small and large dogs alike, this set of clippers tops our list of the best dog grooming clippers. The precision blades are self-sharpening, and the power drive cutting system cuts through even the thickest of hair. The excellent fur feeding system is designed to protect your pet’s hair from snags, pulls, and cuts. Made in the USA, you get a whole host of other grooming equipment in this set. The color guide combs are particularly useful in getting the coat to your desired length. Its combination of great features put it firmly at the top of our list.